This month, our blogging group is participating in an Upcycle Challenge. I love giving thrift store items makeovers, so this challenge was a fun one. We could spend no more than $20 for the item and the materials needed for the makeover. If you’ve seen any of our thrift store makeovers, you know that $20 is quite a bit more than I spend to get new looks for old items. 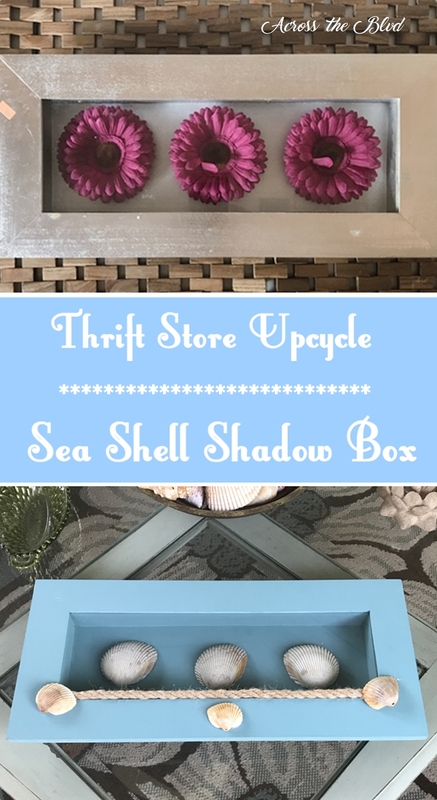 For the challenge, I’m sharing Sea Shell Shadow Box. 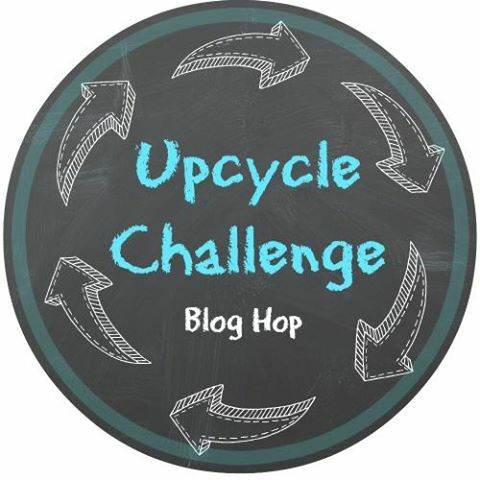 We encourage to you visit our blogging friends and see how they met the Upcycle Challenge this month. We can’t wait to check them out! 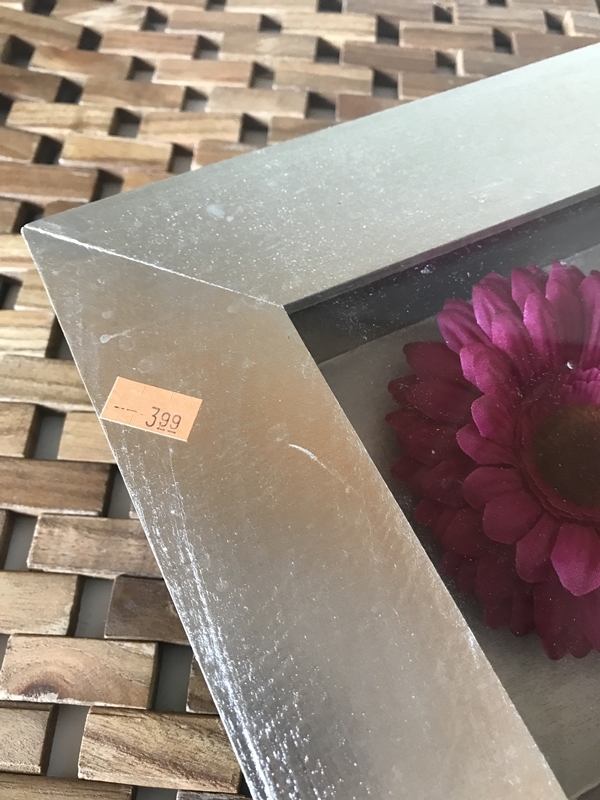 When I spotted this shadow box at Goodwill, I knew it would be great for a makeover. It was priced at $3.99. That was well under the budget for the challenge. The box was well put together and I could see the possibilities for it. I had to pry the back off of the box. I think this was probably someone else’s DIY project at some point. The silver paint caused the pieces to stick together. I used a paint can opener to take it apart. 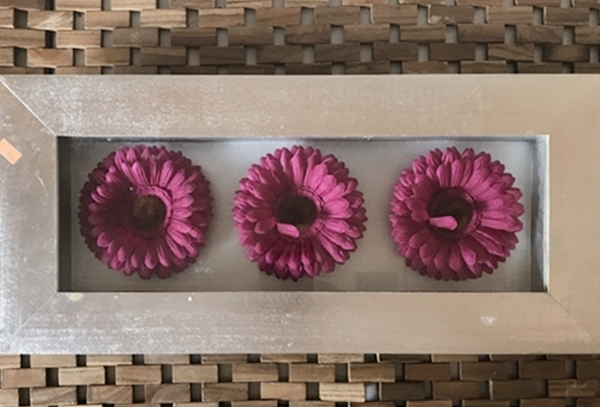 The flowers were glued firmly in place. I used jewelry pliers to remove them. 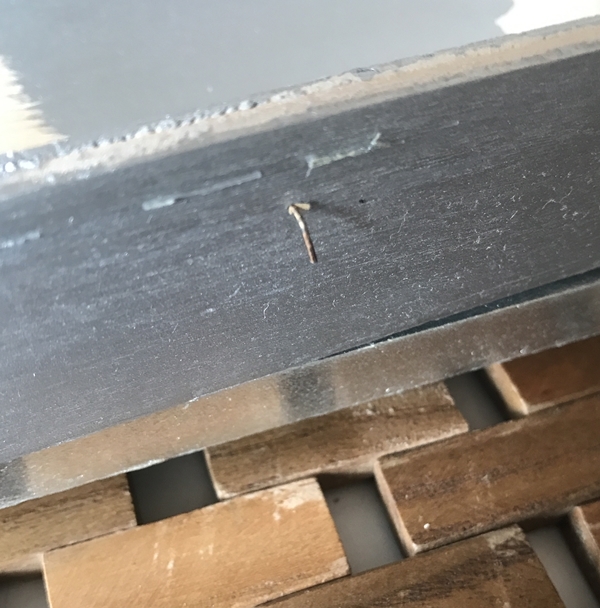 After I had it apart, I saw that there were a lot of tiny nails without heads holding the box to the frame. I used jewelry pliers to pull them all out. These weren’t necessary because the box fit snugly into the frame. 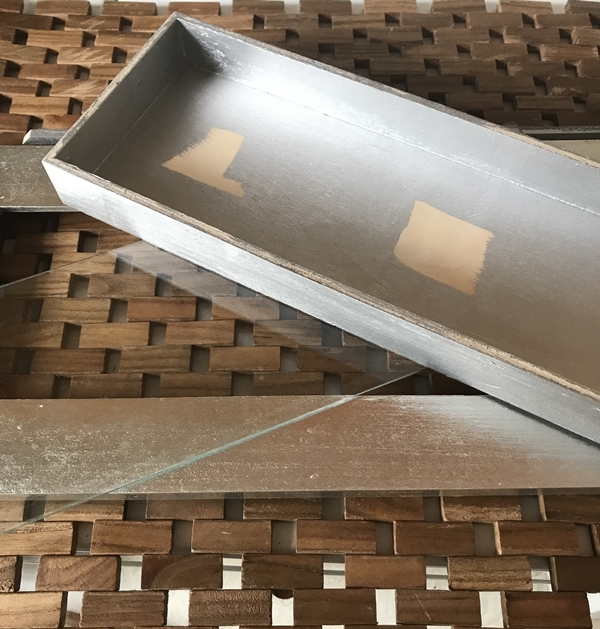 Since I was going to use chalk paint, I didn’t need to sand the box. I used TSP to clean it and some Windex to clear the glass. 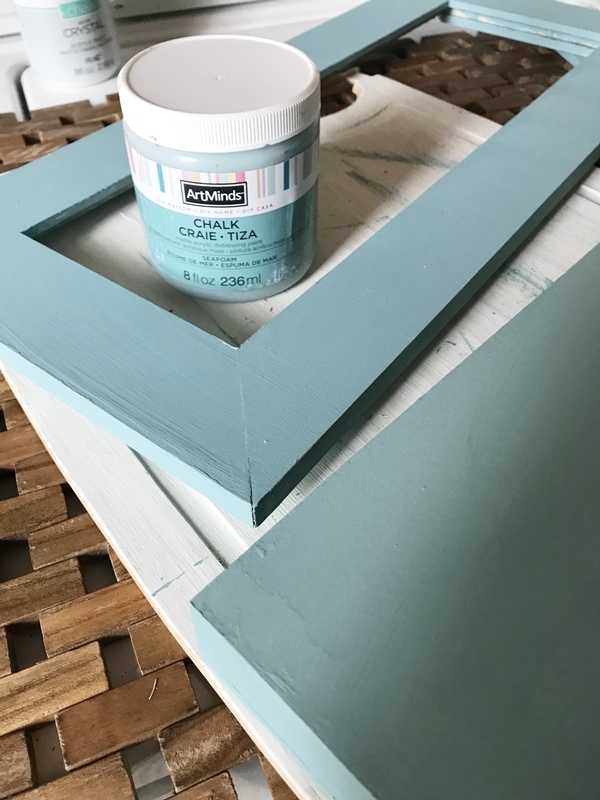 I gave the frame and the box two coats of Arts Mind Chalk Paint in Sea Foam. The sea foam color is great for coastal decor. To continue the coastal look, I used sea shells that my brother has collected from area beaches. I decided to make this as a gift for him. 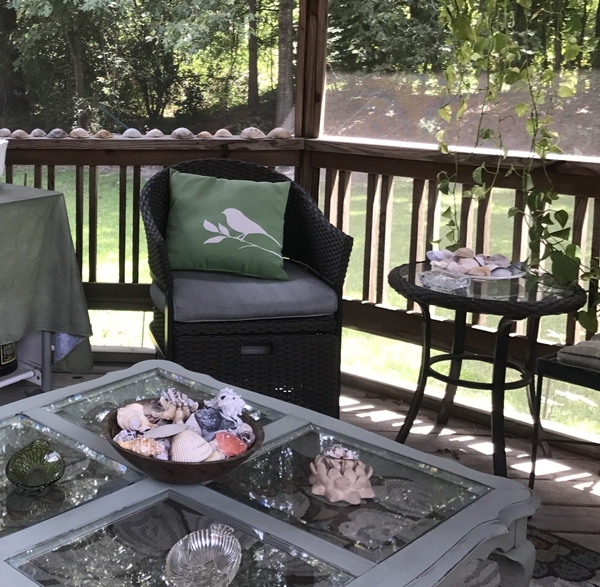 He has a lovely gazebo that has a lot of coastal decor pieces. This shadow box will look great there. I used E 6000 glue to hold the shells in place. After putting the box, glass, and frame back together, I added a strip of rope along the glass. I used hot glue for the rope. To cover the ends of the rope, shells were added at the corners. I added one more small shell on the center of the frame. We tried it out in several spots in his gazebo. This was both an easy and quick thrift store upcycle project. The $3.99 price tag for the shadow box, a little paint, and found shells kept the cost low. What a lovely transformation on a thrift store find! It’s a great way to display sentimental items like the shells your brother found! Thank you, Gail. Giving thrift store finds a makeover is one of my favorite crafting ways to craft. Beverly, This is perfect size shadow box for a tabletop display! The coastal makeover is perfect with that pretty color and added rope detail. What a wonderful gift for your brother using some of the shells he collected for the display. Pinned and shared! Thanks, Laurie! I was happy with how it turned out and my brother loved it, so it was a win! Thanks for putting the challenge together! Thanks for the shares! Looks great – love the coastal color and the rope detail too. I have two shadow boxes waiting to do something with and you just gave me the inspiration I needed! Thanks, Marie! I love that color, too. Glad to have given you an idea! Beverly you know I cannot resist anything that says coastal. This is such a pretty repurpose for the box and the color you chose is perfect. I bet your brother must be feeling very happy right now. Thanks, Mary! We both love coastal decor! And I know you love repurposed projects, too. My brother was happy to have it. Thank you, Marci! I do a lot of little projects for my brother and he helps me with my flower garden. It’s a good trade off! Thanks, Trudy! That paint color is one of my favorites! Thanks for sharing this cute craft with us at C&C with J&J! Thanks for hosting the party, Julie! Hope you’re having a lovely week! You know I love those sea shells!! Thanks for sharing at the Pleasures of the NW DIY party – and thanks for being a part of the fun since the beginning! Thank you, Helen. I appreciate the party and your visits. I enjoyed linking up with you and will miss the party. This is such a darling idea. I have some seashells that I would love to display this way, so I guess that it is time to get busy. I also think that I have some little pieces of wood around the house that I can use so I won’t even have to go to the thrift store to get a box. I will probably have to buy some paint, as I don’t have any of that sitting around. I love the clean look of your blog. It is always a treat to come here and check out your posts. 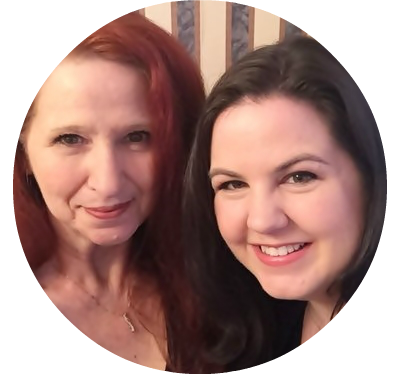 Thank you for sharing at Grandma’s House Blog Party. Shared and pinned. Thank you, Amy. 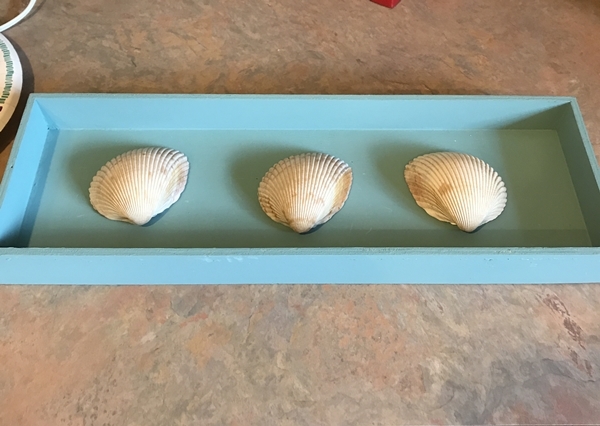 There are so many ways to display shells and this is an easy one! I hope you enjoy creating your own shadow box. Thanks so much for visiting and sharing! 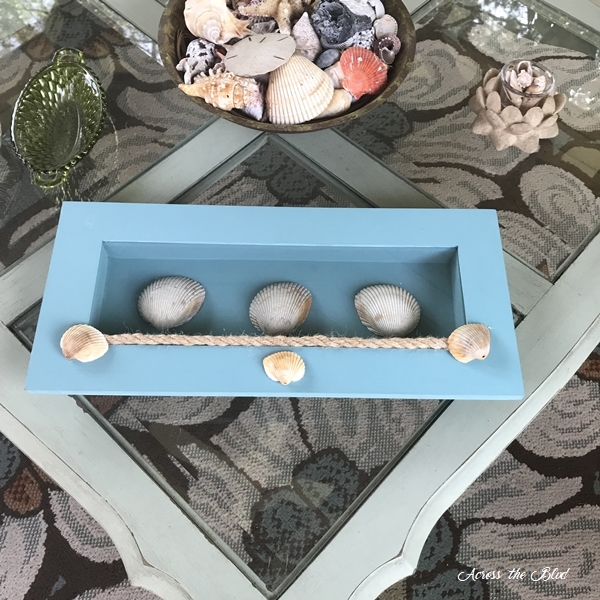 What a fun party, love your coastal shell shadow box. Wish I could find a shadow box, the Mr. doesn’t like going out in this heat to make things so he’s on a building hiatus. Honestly can’t blame him, I don’t like heat much myself. Will have to get myself some of that color chalk paint from Art Minds. Our Michaels has all kinds of new paint and stencils. I have a bit of aqua in living room, love it. Combined with light gray, white and little coral, makes for light pleasant coastal room. Your shadow box is a great project, turned out so beautifully for your gift to your brother, lucky to have your brother close. It looks perfect with his other shells. He’ll enjoy his gift for long time to come. Thank you very much, Jane Ellen. I don’t blame you or your husband for not wanting to go out in the heat to build something! Your living room colors sound lovely and relaxing. I am indeed lucky to have my brother close by. He retired a couple of years ago and moved to Charleston to be close. 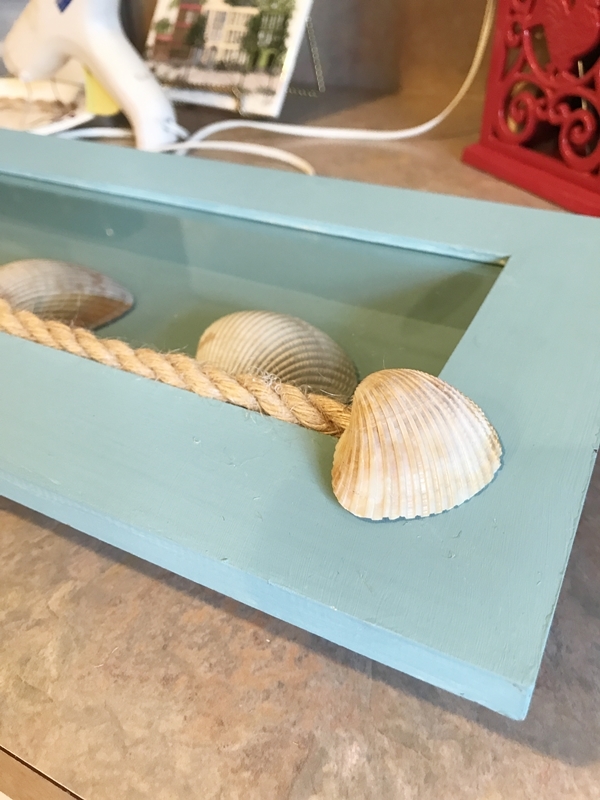 I love coastal decor, and you’ve done a great job transforming this shadow box! 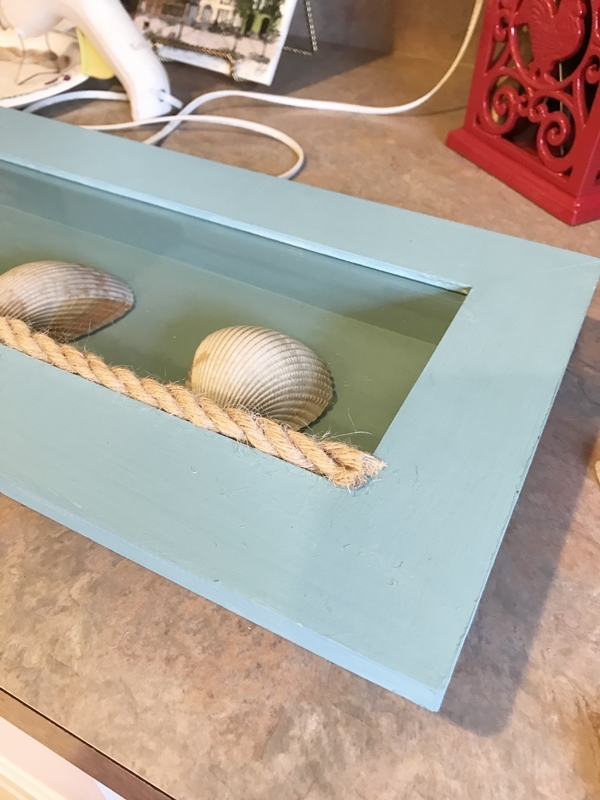 I love the color you painted it, and I like how you added the shells and rope to the outside of the box. Great work! I’m always trying to find ways to turn thrift store items into coastal decor. This shadow box was a fun little project. Thanks, T’onna. Thank you, Christina. I appreciate the party and the visit. Cute project! 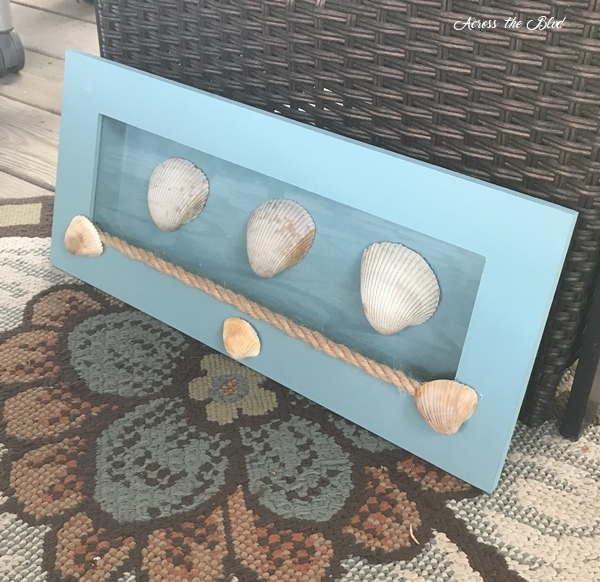 This turned out great for summer decorating with a coastal vibe. Thanks, Carol! The shadow box was a fun and easy makeover. It looks so summery! I love the seafoam color! Thanks for sharing at Sew It Cook It Craft It. Thank you, Lina. I love the color, too. Thanks for the party. 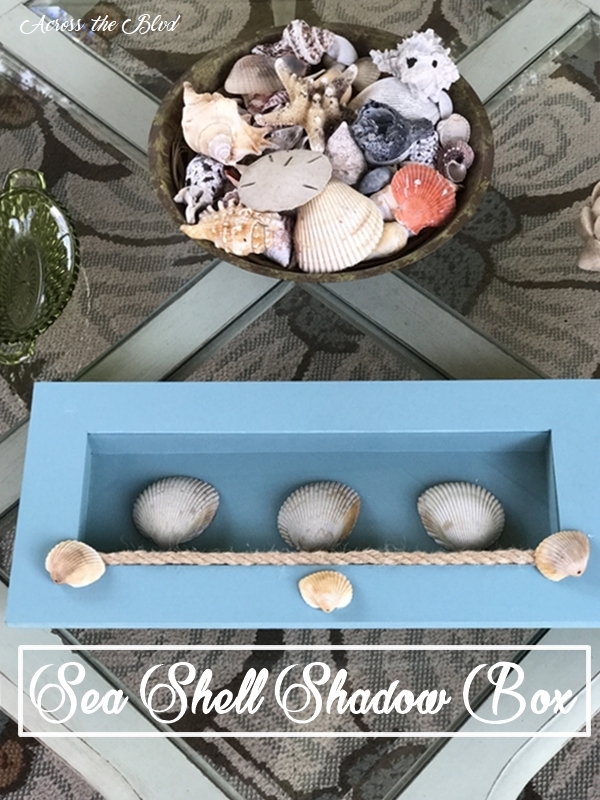 Love your shell shadow box. Hope you stop by tonight since you are my pick at Wonderful Wednesday Blog hop. 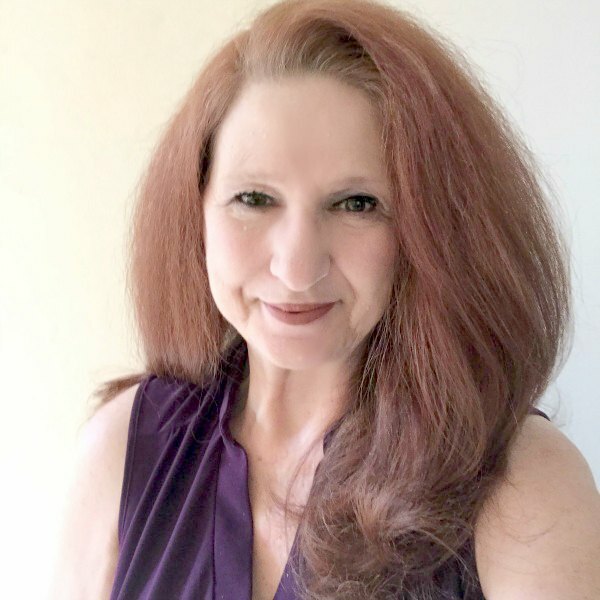 Thank you, Bev and thanks so much for the feature! This is the CUTEST project, i love coastal ideas. Thank you, Karren. I love all things coastal, too! Thanks for the party invitation. Hope you have a wonderful week. I just love this and it would look perfect in my beachside apartment. Thanks for sharing at #blogginggrandmotherslinkparty. have a great day! Thank you, Sue! It was an easy project to put together. Thanks for the party. Hope you’re having a wonderful week. A lovely project! Thank you so much for sharing with us at #BloggingGrandmothersLinkParty. I have shared on social media. Thank you, Clearissa! Thanks for the party and the shares. Thanks for the party and the social shares, Carol. BEAUTIFUL PROJECT, i LOVE HOW IT TURNED OUT! I love it! 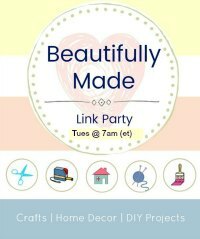 You always come up with such great creativity and of course I like the theme 🙂 Thank you Beverly for linking up at the #BloggingGrandmothersLinkParty. I shared your post on Facebook, Google+, Pinterest, and Twitter. Thanks so much, Dee! I appreciate the party and the social shares and the amount of time you put in to promoting others! What a fun challenge! I’m all about ocean decor right now, so I love your creation. thank you for sharing it at the #blogginggrandmotherslinkparty1 sharing! Thanks, we have fun with our monthly challenges. Thanks for the party and for sharing, Teresa! Thanks, Dee! I’m delighted to have been featured. I’ll be by the party soon.